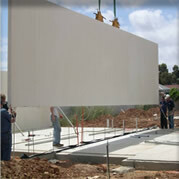 Rapidwall is a prefabricated walling panel with broad construction applications. It is suitable for load-bearing walls for individual domestic cottages as well as for multi-storey residential buildings; formwork for suspended concrete floor structures and for most other purposes for which traditional building materials are currently used. Rapidwall is manufactured in a moulding process using glass-fibre reinforced, water-resistant gypsum plaster and water proofing additives. All panels are up to 12 metres long and 3 metres high. The panels are cellular in form and 124 millimetres thick. The formed cells can be used to accommodate building services such as plumbing and electrical conduits or they can be filled with insulation, for increased thermal performance, or with concrete for increased load bearing structural capacity.